She’s amazing!! Yesterday I passed papers on my parent’s home. Two years ago I had to sell my grandparent’s home. Both homes were sold by Kristin Gennetti. The first experience was so positive, I told her I would call on her to list my parent’s home. Smartest move I ever made. 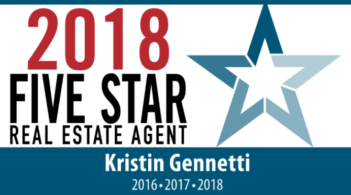 Every step of the process, Kristin was professional, knowledgeable, reliable and responsive. I value people who have a strong work ethic, are honest, reliable and respond to queries in a timely manner. If you also value these traits, Kristin personifies all of them. No matter what time of day/night, Kristin was a phone call, text or email away. For decades, I dreaded the thought of having to sell these homes. Today, I still can’t believe it is done and it was an amazingly smooth and quick process. Why? Because of Kristin. I’m so grateful that a friend recommended her to me.